The area of this remote peninsula which we searched for wildcats was as perfect a setting for the creature as you could imagine - steep moorland slopes extending as far the eye could see, fissured with numerous clefts and strewn with lichen-patterned boulders. But in several hours scanning we saw not a single wild animal of any description. Time and again we willed the cat's unmistakable wide-eyed glare to emerge from the shadows but, as with so many wildlife quests, we achieved our goal once released from the pressure of intense expectation. During the drive home a pair of eyes flared amber in the headlights and the moment I took in my first full view of their owner - the broad head, long white whiskers, grey-green coat disrupted by intense black stripes and the thickly furred black-tipped tail - was just as memorable as my first sightings of lion or tiger. It then sat for 20 minutes on the roadside, as unconcerned by our presence as we were riveted by its own. 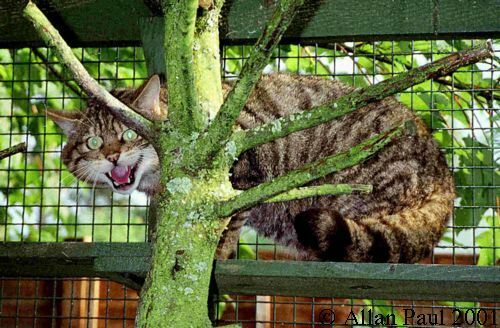 Ironically, while our sighting in many ways reflects the wildcat's recent triumphant emergence from centuries of persecution, its survival may yet still be threatened in Britain. The fresh challenge comes in the pampered and alluring shape of female house cats. Our pets are of a different genetic heritage to Britain's only surviving wild felid, having descended from African wildcats that were first domesticated by Egyptians 4000 years ago. However, the closely related species will interbreed, and in the absence of pure-bred females, young wildcat toms will mate with their tame cousins, a process that is diluting the genetic purity of this strikingly beautiful predator.